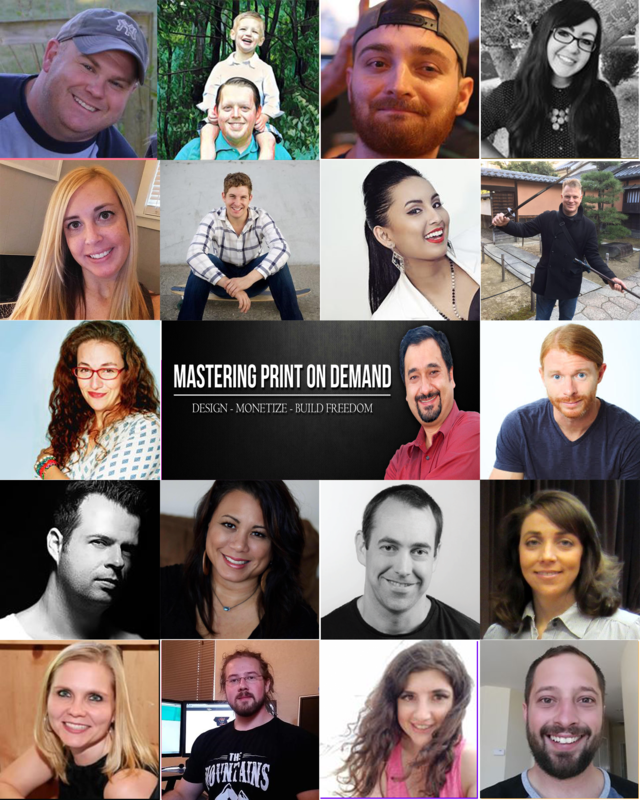 Print on Demand Mastery is not a designing Course, I provide plenty of resources for Designs but is not the purpose of this Course. Our Course has seven sections covering everything you need to know to have successful Print on Demand Business. A Bonus Section with a Course on how to do Amazon Custom is included at no extra cost. A Full Bonus Section with resources to run your Print on Demand Business. The Course Includes Over 50 Video Lessons covering a wide variety of Topics, Plus over 20 Interviews with Top Players in the Industry and Social Media Experts as well as over 20 Videos with supporting information. The Course is written and taught from a business perspective, is all about the right Mindset and Drive to get the desired results. Free Facebook Group with a minimum of 1 Live Session a Week to Cover the Material on the Course. The course is $497 but for a limited time you can have full access for $247 to celebrate the relaunch on Thinktific. It shows the ins and outs of the POD industry! This course is above and beyond! It shows the ins and outs of the POD industry and helps anyone who is serious about starting a POD business or already has one to organize their thoughts and make an informed plan. I found myself referring to it before listing my designs on a new POD or starting a niche specific Facebook page and much more. Fernando has put everything he knows about the POD industry (which is a LOT) and he didn’t stop there, but added those invaluable interviews with some of the leading people in areas that any one with a POD business has to deal with. Thank you Fernando for this truly unique course! I absolutely love it! This is the course that keeps on giving. There is so much content that it could easily be broken up into 5 separate courses and Fernando keeps adding more. No Print on Demand questions are left unanswered, whether it has to do with design, keywords, selling platforms, strategies, even mindset, and the contributors are all experts in their own right. You don't need to look anywhere else if you want to bring in a healthy income stream doing Print on Demand, it's a one-stop shop. It even comes with a very active FaceBook group for networking and continuing education, as well as ongoing interviews with the movers and shakers in the field. It's crazy affordable for what you get! I have extensive knowledge of Contract Management but my passion was always E-Commerce since 1998 when I began selling toys on Ebay. In 2015 I decided it was time to do this full time again. Since then, I have been able to grow my yearly earnings to be far greater than the 6 figure income I used to make in the Oil and Gas Industry working an 8 to 5 job. Print on Demand was something that was never on my radar. I never thought I would be selling shirts but today I have presence on Shopify, Etsy, Amazon.com, Merch by Amazon, Ebay, Redbubble and a few other platforms. Where Should I Sell My Designs? Can I Work on this Idea? 5. What Should you Design? 6. Which Platform is the Best for Me? 7. How can my Products get Found? How Can my Products be Found? Why Have a Social Media Presence? Thank you and Whats Next? What is it and How Can I Apply?